where is polynomial degree and is frequency response of a quadrature rule. This relation is very interesting as it allows us to build numerical integrators in frequency domain (see differentiators and smoothers for example). 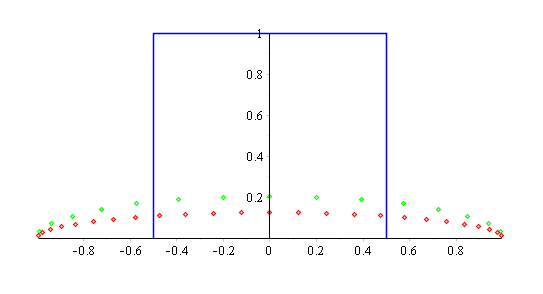 Green curve is a frequency response of Gauss-Legendre quadrature of order , red – and blue curve is the function. As strange as it might seem, frequency response of GL quadrature coincides exactly with near zero and tend to be the one as order of quadrature grow. In other words, GL approximates the in frequency domain. Fourier transform of GL nodes (dots) approximate the Fourier transform of a blue square (which is ) near zero. I love such deep inter-connections between seemingly disperse fields of mathematics. First it should be like this (consequence of universal laws of nature), secondly it makes me believe that we are using the right instruments to describe the nature (which make inter-connections apparent).